Dr. Doug Lefton of Fairlawn, Ohio, developed a way to lower patients' cost for lab tests. The Summit County Medical Society and Dr. Doug Lefton's arrangement for the low-cost laboratory test program was made with PrePaidLab LLC, not Laboratory Corporation of America (LabCorp). PrePaidLab CEO Tom Patton's statements represented only his own views, not those of LabCorp. (CNN) -- Day after demoralizing day, Dr. Doug Lefton watched uninsured patients leave his office needing laboratory tests but unlikely to have them done because of the cost. "It's a little heartbreaking when you have someone in your office and they need a blood test and they won't do it because they can't afford it," Lefton, 56, said. So the Fairlawn, Ohio, family physician decided to do something about it. Working with other doctors and an online marketer, Lefton devised a way to slash the cost of lab tests not only for his patients but for almost anyone, anywhere. As a former newspaper reporter, Lefton understood how publicizing a problem can generate solutions. He contacted the Akron Beacon Journal, which subsequently published a story highlighting the high cost of lab tests. He was soon contacted by Tom Patton, CEO of PrePaidLab LLC, an Avon Lake, Ohio, online marketer of lab tests. Working with the Summit County Medical Society, Lefton struck a deal with PrePaidLab. The arrangement allows patients to get lab tests done for a small fraction of the normal cost, simply by ordering them through the medical society's website. "These people that would ordinarily not be able to afford lab work are paying almost identical the amount the government pays for Medicaid," Patton said. "(The prices) are spectacularly low for something you can get on the market yourself." For example, a lipid panel (cholesterol test) in Lefton's area can cost as much as $148 for an uninsured person. The same test is available for less than $18 through the site. Here's how it works: Patients needing lab work can go to the medical society's website and click on the big yellow box in the middle of the page. From there they choose the tests their doctor says they need, give the doctor's fax number, pay with a credit card and print out the order. They then take the order to any LabCorp location in 47 states and have the work done. Results are sent securely to the patient and the doctor, often within 24 hours. "It's like using Amazon.com to buy your lab tests," Lefton said. The service is a boon to uninsured and underinsured patients, for whom lab tests can be prohibitively expensive. "If I were laid off tomorrow or you were laid off tomorrow, we probably would be paying astronomical prices for blood tests," Lefton said. Jeff Hughey of Akron, a 50-year-old information systems technician, needed a comprehensive metabolic profile, a lipid panel and a hemoglobin test for blood sugar. Even with health insurance, the three tests were going to cost him more than $400. "Insurance doesn't kick in until you have paid $2,000 out of pocket," he said. "... I just couldn't afford over $400 for three simple tests." Hughey remembered the doctor had mentioned the low-cost lab website. "I got online with PrePaidLab, registered with them, checked the pricing, and the final total was $50.45, including the $9.50 service fee," he said. Hughey had a doctor's appointment two days later, and he and Lefton had already seen the results of the tests. "You're prepared when you go to the doctor," Hughey said. "You're not blindsided by any out-of-sorts results." Except in New York, New Jersey and Rhode Island, anyone in the U.S. can use the service. There are no income guidelines. "There's nothing embarrassing about this. Nobody knows that this is how you've done it or you don't have insurance or whatever, because when you go in there, you just hand them a piece of paper and people are thinking those are just the doctor's orders," said Marie O'Dell, 57, who owns a fast-food franchise with her husband, Steve. Steve O'Dell, 60, lost his health insurance coverage a year ago, so cutting costs is important. He recently had three lab tests done through the program, and his wife had two, all for less than $100, she said. "That's even better than us paying the deductible," she said. "You don't have to be uninsured, but let's say your deductible is high, or you're on Medicare and you want to save some money. You can use that service too." It's like using Amazon.com to buy your lab tests. The O'Dells, who are not Lefton's patients, have been telling everyone they know about the inexpensive tests. "It's the best thing we ever found, because when you're diabetic or you have cholesterol and you have to have this stuff checked pretty regularly so nothing happens, it's a good thing to have," Marie O'Dell said. O'Dell, a former nurse, cautioned that doctors need to be very clear in writing down which tests they should order for their patients, because there are many from which to choose and it can be confusing. 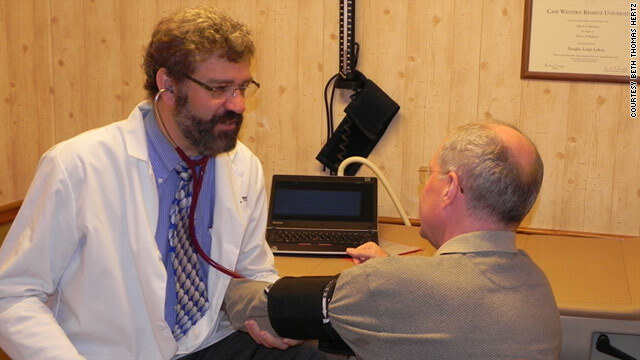 PrePaidLab set up a physicians' portal so patients who lack computer access or don't have a credit card can order their tests through the doctor's office and pay cash there. Patton said the prospect of higher volume allowed PrePaid to accept the lower fees. "The only subsidy is out of our end," he said. "We just gave them a lower fee schedule. Believe me, the margins are very, very low. But it's for a good cause." Lefton was adamant that the program be set up strictly for the benefit of patients. "Doug's kind of a different guy," Patton said. "He made it a point this was going to be his program, no doctors were going to make any money off of it, and that's it." Marie O'Dell noted that the program could keep people out of emergency rooms and hospitals at taxpayer expense. "It kind of saves everybody money that way." Because the program has not been widely publicized yet, only about 100 people a day use it, Patton said. But those who have used it, including O'Dell, are grateful. "It's a great service. I should probably write (Lefton) a letter and thank him," she said.